Large Stainless Steel Base Camp Kelly Kettle – 54 oz. Now you have it all! Every product that Kelly Kettle makes, all in one place. 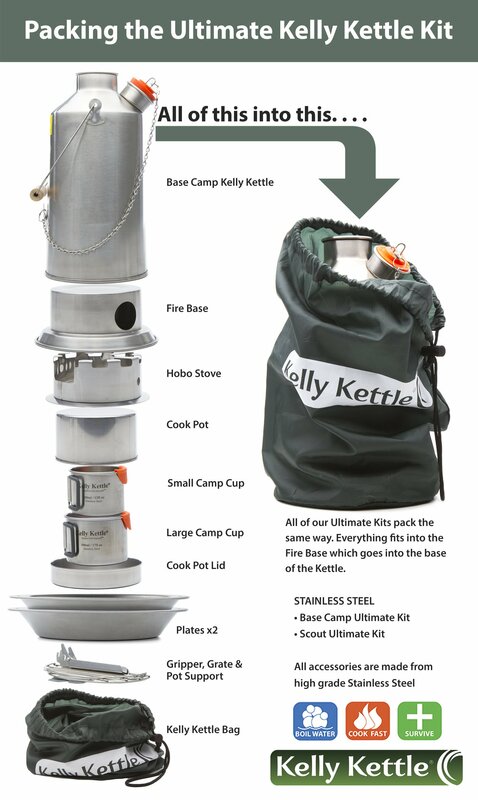 The “Ultimate” Kelly Kettle Stainless Steel Base Camp Kit! This ultimate complete camp stove kit includes everything you need to boil water, cook fast and survive. Whether you want to cook above the chimney while you’re boiling a kettle full of water, or just want to cook over the handy Hobo Stove accessory for longer periods of time; you can do that, and much, much, more with your Kelly Kettle Ultimate Camp Kit. Need to measure out 16 oz. of water for your freeze dried meals? No problem! The stainless steel packable cup set has measurements in both oz. and ml.. Plus, now you get our brand new packable plate/bowl set, which also packs away with all the other accessories in the handy Kelly Kettle carrying bag. You already know the benefits of owning a Kelly Kettle – No fuel to purchase, no canisters to dispose of, works perfectly every time, in ALL types of weather, and at any altitude. The Kelly Kettle can even be taken on planes back into the back country. No restrictions here! You’ve been waiting long enough. Be prepared, and purchase your Kelly Kettle Camp Stove today. What’s Included: – Large Stainless Steel Base Camp Kelly Kettle – Holds 54 oz. (1.6 liter) of water. Large Stainless Steel Cook Set – which includes 32 oz. pot – Lid/Frying Pan – 2 Piece Grill Set – Pot Gripper. Kit also includes the Pot Support for cooking above the chimney – Large Stainless Steel Kelly Kettle Hobo Stove – Two Stainless Steel Packable Kelly Kettle Cups with CooLipTM protectors and measurements inside in both oz. and ml. and, two stainless steel packable plates/bowls. 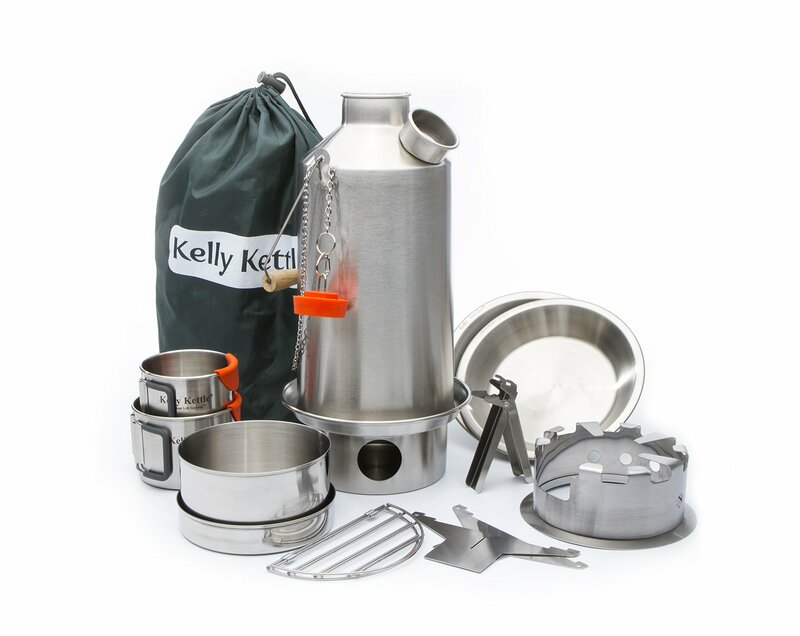 The Kelly Kettle also comes with a handy carrying bag, that holds all the Kelly Kettle products in one place. The “Ultimate package”. . . The best bang for your buck! Makes the perfect Scout Camp Stove. More practical than Biolite or Jet Boil, Jetboil Camp Stove. Kelly Kettle, “Outdoor Life Enjoyed”. Two Stainless Steel Packable Kelly Kettle Cups with CooLip protectors and measurements inside in both oz. and ml.